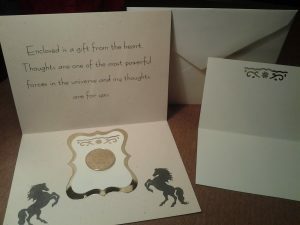 Currently working on a new Gift Coin program to spread love to our U.S. Troops. Brass Peace allows me to follow my life's passion for supporting our U.S. troops overseas to make sure they know they matter and someone cares. I don't make money at it. The profits go back into materials and advertising... More of a hobby that I love. It's set up as a business that pays for itself to bring value to everyone involved... first and foremost - for our U.S. Troops. This is critically important to me. Everyone needs love to make it through tough times. If money gets tight at home I'll get a sponsor. This mission is what I'm on earth for. We're all here on earth to create relationships and to provide love for others. That's all. These men and women put their lives on the line everyday and stay away from family and friends for months and years at a time to protect our freedom. A new direction... but first some background. 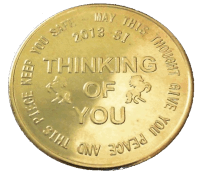 Between 2013 and 2014 we were providing a service that sent brass coins minted with the words "Thinking of You" along with notes of peace from caring individuals. 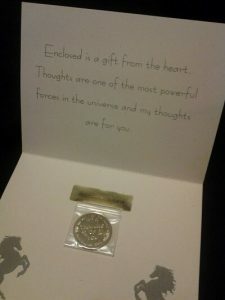 Hence the name "Brass Peace"
A few of the Brass Peace Gifts sent are on the images on this page. A total of 1,058 were sent to military personnel overseas including all branches to Soldiers, Marines, Sailors and Airmen. An additional 46 were distributed in the U.S. through gifts, promotions and a few sales for a total of 1,104. I still have ~ 200 coins not distributed. Well, to be honest, I kept them in the garage. Bad idea. Someone stole the rest. They are made of red brass. I assume it was for the scrap value and we think it was stolen by a person addicted to Heroin. I cannot divulge who I think it was. Why did you start Brass Peace in the first place? I had amazing parents. My dad fought in WWII in a B-17 bomber as a Ball Turret Gunner and Radio Operator. I simply couldn't wrap my head around the worry, fear and longing for home he must have encountered. I'm convinced that the love and thoughts that were sent through letters from my mom to him through those years and trials got him through some very rough times. I want that for our current U.S. Troops. I want them to know how much we love them and appreciate what they do. I saw this when my Father would exchange letters with his fellow crewman years and years after the war. The cardboard box in the attic was ruffled and torn. Holding a flashlight, I noticed large writing in black marker which read, "Mom's stuff" on one flap of the box. Peeling away the top I saw, in a corner next to a stack of cookbooks and the bible, a neatly arranged set of opened and yet, full envelopes. Within these envelopes were letter upon letter between my Dad and my Mother (then his girlfriend) from when he was serving in the Army Air Corps in WWII. 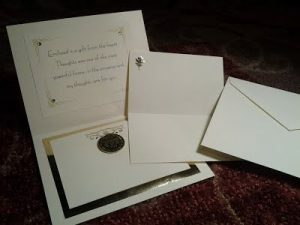 The ability to bond through these letters gave them both hope and encouragement. These two major feelings combined with constant communication kept that budding relationship alive all the way through the time he came home. So, my father and mother's communication of love was my inspiration. I believe we are an extension of God's love and that this program would simply extend His love to many. I wanted to start something that would make a difference before I leave this earth... so I started Brass Peace. Currently I'm working on a program with larger, higher quality coins for the troops. I'm so excited... this will pay for "Hand-Written Letters to Troops" events too! Stay tuned by entering your email in the box below.